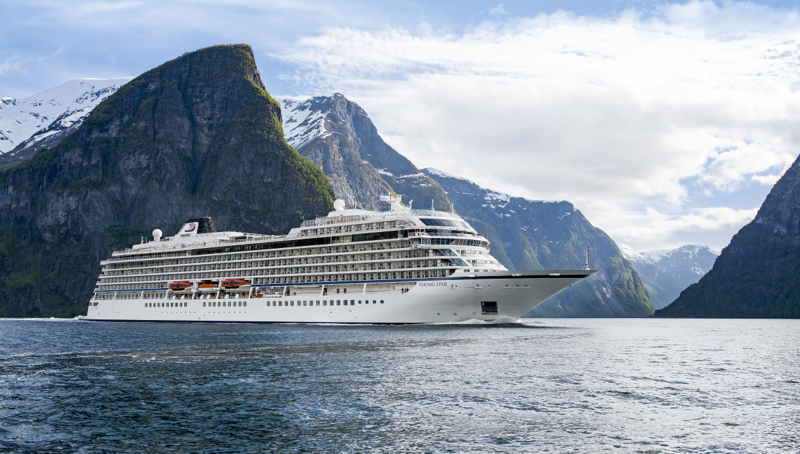 Viking Cruises today announced a new ocean cruise itinerary that will allow guests the rare opportunity to explore the far north in Norway’s winter, during a peak period for aurora borealis sightings. Sailing between London and Bergen starting in January 2019, In Search of the Northern Lights will establish Viking as one of the few cruise lines to offer a full-length itinerary in the Arctic Circle in the winter season. Experience the Northern Lights in Alta: Home to some of northern Europe’s most magnificent natural beauty, Alta’s frequent clear skies make it an ideal place to view the luminous aurora borealis during the height of the viewing season. Experience Nordic Life with the Sami Community of Máze: While in Alta, visit the nearby native Sami community of Máze for an authentic lunch of local dishes and an exciting ride in a reindeer-drawn sleigh. Visit the Arctic Cathedral in Tromsø: Home to the largest concentration of wooden houses in northern Norway dating back to 1904, marvel at the classic architecture contrasted with modern buildings, including the Arctic Cathedral, a stunning triangular building in white and icy blue often called the “Opera House of Norway” for its resemblance to the Sydney Opera House. Step into the Viking Age in Stavanger: Visit the Archaeological Museum, where a host in traditional Viking dress will demonstrate essential tools and artifacts of the time period, then stop at the Swords in Stone monument commemorating the Battle of Hafrsfjord in 872. Ascent of Mt. Ulriken in Bergen: A panoramic tour of Bergen takes you to the beautifully preserved wharf of Bryggen, a UNESCO World Heritage Site that was central to Bergen’s role in the Hanseatic League. Afterwards, embark on a gondola ride for a scenic ascent to Mt. Ulriken, the highest of Bergen’s famous Seven Mountains. Designed for discerning travellers with interests in history, art, music and cuisine, Chairman Torstein Hagen often says Viking offers guests “the thinking person’s cruise” as an alternative to mainstream cruises. Ships are small to get guests closer to their destination, with more time in port and more overnights. Onboard, guests find serene Scandinavian spaces, where every room is beautiful and functional, quiet and filled with light. All-veranda ships mean that guests experience every day with a new, expansive vista. With the most al fresco dining at sea, featuring regional cuisines and always-available classic dishes, Viking’s guests can truly dine in their destination. A focus on cultural enrichment brings immersive experiences onshore and onboard. And only The Viking Way brings guests itineraries that feature Local Life, Working World and Privileged Access experiences. In addition, Viking Inclusive Value provides a small ship experience at a big ship value – with every cruise fare including flights, a veranda stateroom, shore excursions in each port of call, all onboard meals, and all port charges and government taxes. Guests also enjoy many complimentary amenities as part of their fare, including: beer and wine with lunch and dinner service; premium dining reservations; Wi-Fi; self-service laundry; access to the Thermal Suite in the LivNordic Spa; and 24-hour room service. Pricing for Viking’s new In the Search of the Northern Lights cruise starts at £4,395 per person. From now through June 30, 2017, Viking is offering an Early Booking Discount on the itinerary, saving up to £500pp – this offer applies to all ocean cruises. Call Viking on 0800 298 9700 or contact a travel agent for further information.